Making mixes is getting unnecessarily difficult. See the above cover for instance. The picture is warped to billio because the software I use, Nero, is playing up. Elsewhere my main PC had its new SSD drive fail, etc. etc. Grrrrr. In a happier place the mixes are flowing, but just not to the web. Bingo Trappers are an excellent Dutch alt country band, Beachwood Sparks riff on that Flying Burrito Brothers sound while Dylan LeBlanc has a quiet turn of phrase that I find charming. Courtney Barnett visited recently and by all reports she put on a good show. Mogwai are coming next year. You may recognise the Handsome Family track as it was featured in the True Detective TV series. Sit close to the screen for a healthy dose of alt country. Take it away Calexico. There should be a playable playlist below, or try this link. True Detective at the Oscars…. Me too. Pick one and I’ll send you a disk for Christmas. Old school and new school country / alt country here. 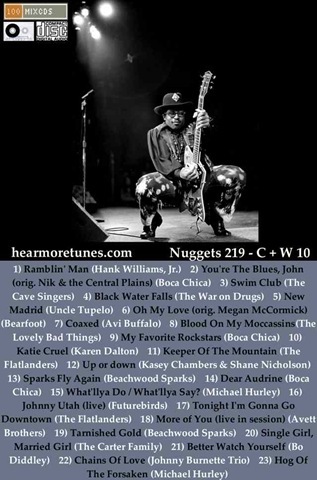 I love the cover picture – Bo Diddley of course. Boca Chica deserve more fame. I can’t find any good videos, so here is a Bandcamp widget instead.